Doesn’t matter if they’re fried, baked stuffed, raw, or made into a sandwich, oysters just about always hit the spot. Now you may have heard the legend that good oysters only come during months that contain an “r” in their name. It’s an old rule dates back to the days before refrigeration when oysters could spoil quickly. However, nowadays they can be found in supermarkets all year round, but they’re best eaten in the colder months from September to April. So, this being the last month of the season, we decided to leave you with a ‘lil recipe to make sure you get your oyster fix while you still can. 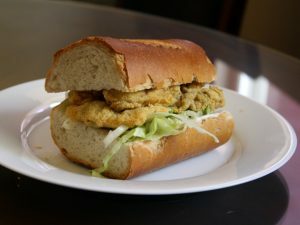 Mmmhmmm… We’ve got an Oyster Po’ Boy Recipe that’s guaranteed to be the best oyster dish you’ll eat outside of New Orleans. Add a little Small Axe Sauce to spice it up and you’ll be feeling like your dining on a Caribbean Island. But before we get to the recipe, how much do you know about these salt-water, bivalves? There are two main types of oysters: True Oysters and Pearl Oysters. True Oysters are the edible ones while Pearl Oysters produce those beautiful shiny pearls that you may be wearing around your neck. 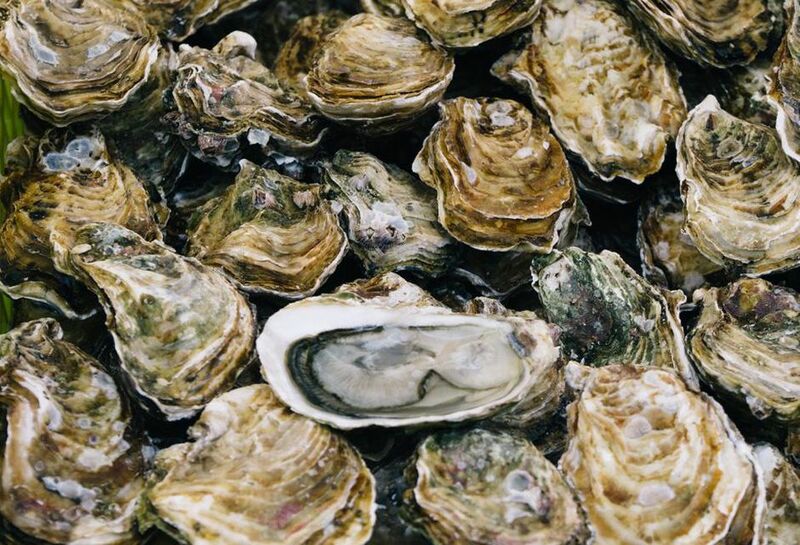 Did you know the largest pearl-bearing oyster is roughly the size of a dinner plate? When buying oysters, avoid ones that are open or don’t close right away after you lightly tap them on a surface. That means the oysters are dead. You can make sure they are live oysters by their smell. It should be like the sea (or whatever body of water they were harvested from). In this delicious recipe below, the oysters are tossed in a flour and cornmeal mixture, then quickly fried — just under a minute — so the crust is crackly and golden brown. Sure, it may seem like such a simple sandwich, but when you bite into it, you’ll see why we’re confident in this spicy oyster Po’ Boy. So get down to your local super market and follow our instructions to get the perfect oysters before its too late! While that’s warming up, whisk together the egg, milk, 1/2 teaspoon salt, 1 teaspoon black pepper in a bowl. In a shallow dish, combine the flour, 1/4 teaspoon salt, and the rest of the black pepper. In a second shallow dish, whisk together the cornmeal, remaining salt, and the cayenne. Pour enough oil to come about 3 inches high in a heavy bottomed pot. Turn the heat to medium-high, and bring the temperature to 375°F. Adjust the temperature to maintain this temperature. Spread a thin layer of mayonnaise on to the cut sides of the bread, top with lettuce, and then some of the oysters. Serve.